Would you like to see your art in print? Your art could be on the front of the Centennial Agenda Book for the 2019-2020 school year. Testing will begin late April into May. See attachment for a full schedule. Congratulations to The Falconiers and choir director Mr. Vaughn! They received an award for their contribution of their talent to benefit Spokane’s Ronald McDonald House. They performed at an event called The Gallop Auction Charity Event. The Falconiers did such a beautiful job! They were asked to return again in the New Year. 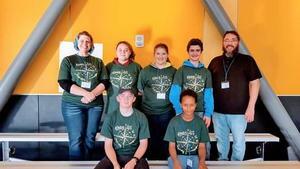 Mrs. Wright and Mr. Hickman took our TSA Leadership team to Central Washington University for the Fall Leadership training recently. While there, students participated in leadership activities, boat building and racing, and several breakout sessions around TSA Leadership. These breakouts sessions included: professionalism, chapter offices, program of work, fundraising, public speaking, and parliamentary procedures. Students were amazing and had a great time. They were so excited to be able to come back and share what they did with the rest of our TSA team. Please submit your votes for next years ASB Officers. GIRLS & BOYS BASKETBALL START DATES CHANGED! Please note that BOYS Basketball will start on Thursday, January 3, 2019. GIRLS Basketball will start on Tuesday, February 19th! Our Fantastic Falcons raised a total of $18,129.65 for our Annual Fund Run! This is outstanding and will help support the athletic programs we offer at CMS as well as all of our ASB student activities throughout the school year! We're so proud of our students and want to thank the entire West Valley School District for their amazing and unending support! School starts at 9:45 tomorrow. 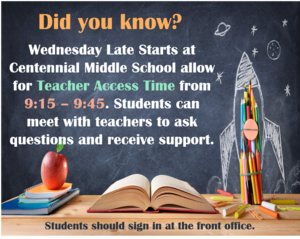 Students have access to Teacher's for questions or to receive help from 9:15-9:45 on Late Start Days!! The West Valley School District is very much committed to creating and sustaining a safe school environment for all our students, staff and parents. To that end we have decided to bring in a nationally recognized motivational speaker/trainer to our school district to conduct school assemblies for 6th through 8th graders as well as 9th through 12th graders on how to survive an Active Lethal Threat Event whether in or out of school. Our school assembly will be held on Tuesday, November 27th. HOW TO PURCHASE PE UNIFORMS! All CMS students are required to wear a PE uniform which consists of a shirt and shorts. They may be purchased from Momentum Ink for $15. Please see the attached flyer with instructions of how to purchase them online. If you do not have access to the internet, we will have a few uniforms available to purchase in the main office after August 22nd. Please order your uniforms now so they will be delivered the first week of school! Thank you!